This past Saturday was back to routine: the usual morning trip to Costco headed the list. Like it has been for a while, the store wasn't very crowded and there were plenty of parking spaces still available when I left. Gas prices continue to drop - today it was $2.329 per gallon and the total came to under $20, something I haven't seen in a long, long time. 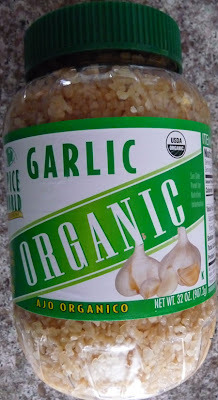 I can't resist trying new seasonings, especially when they come in a giant container and cost so little like at Costco. $4.69 for the collection of "Rustic Tuscan" spices. And in the same section was dragon breath in a bottle, only $3.49. I don't see how spices can be so cheap at Costco and so expensive everywhere else; it tastes the same. After Costco I headed over to the library to get a book I had requested several months ago that finally weeded its way through the other requests in the queue and got down to me. If you haven't heard of it, I highly recommend it if for nothing else than shock value. 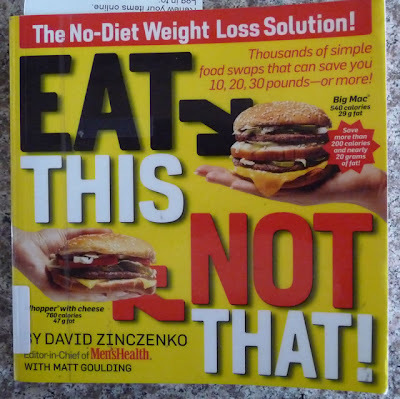 It's pretty alarming to find out just how unhealthy many of the foods are that are served at fast food and chain eateries, even those under the guise of sounding like they are healthy and good for us. 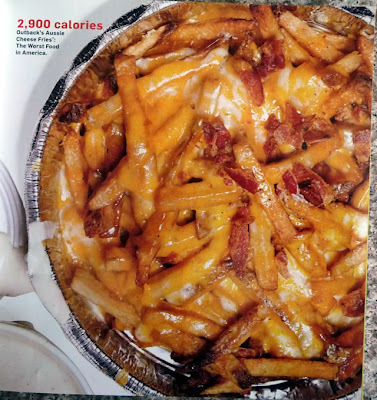 The below Aussie Cheese Fries from the Outback Steakhouse are declared the "Worst Food In America" by the author, weighing in at an astonishing 2,900 calories! They sure look yum, though. One of my favorite comfort foods is a Swanson's chicken pot pie. My particular method of eating these is to poke holes with a fork around the perimeter to separate the edge of the crust that is on the tin from the crust that tops the pie. Then I eat the filling and save the crust for last - the browned, crunchy edge and then the bottom part that has soaked in the chicken broth/liquid of the filling. Mmm, that is so good. There's so much fat in these things that I don't eat them anymore but from reading the book, things could be worse in the pot pie world. 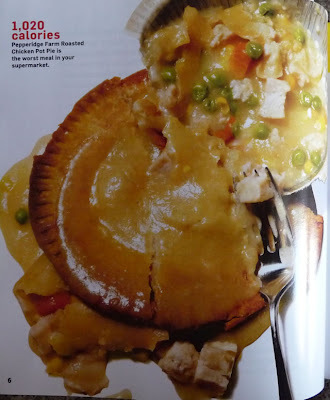 The below Pepperidge Farms chicken pot pie is the worst meal you can get at the supermarket, so says the author, with 1,020 calories and 64 grams of fat. At least the Swanson pies have only 400 calories. Just trying to find "healthy" items when eating out is a chore and most of the things that qualify are no fun to eat. Prepared foods at the market are no better, either. I always look at the box to see the calorie count, which at first glance doesn't look bad at all, but then I notice the serving size is downright miserly. Use a normal serving size and all of a sudden the caloric content blooms out of control! You know, when it comes to figuring out what makes for a healthy diet, actions speak louder than words. The authors of diet or health or exercise books - have you ever seen them in real life? How do we know that they are living proof of what they preach? We don't!